Throwing deadly objects while wearing jeans and drinking beer—yeah, that doesn’t sound like a good idea, much less a good workout. But it turns out that hurling hatchets at a wood wall for a few hours on a Friday night can burn some calories while engaging your chest muscles, triceps, elbow flexors, and maybe even your abdominals. 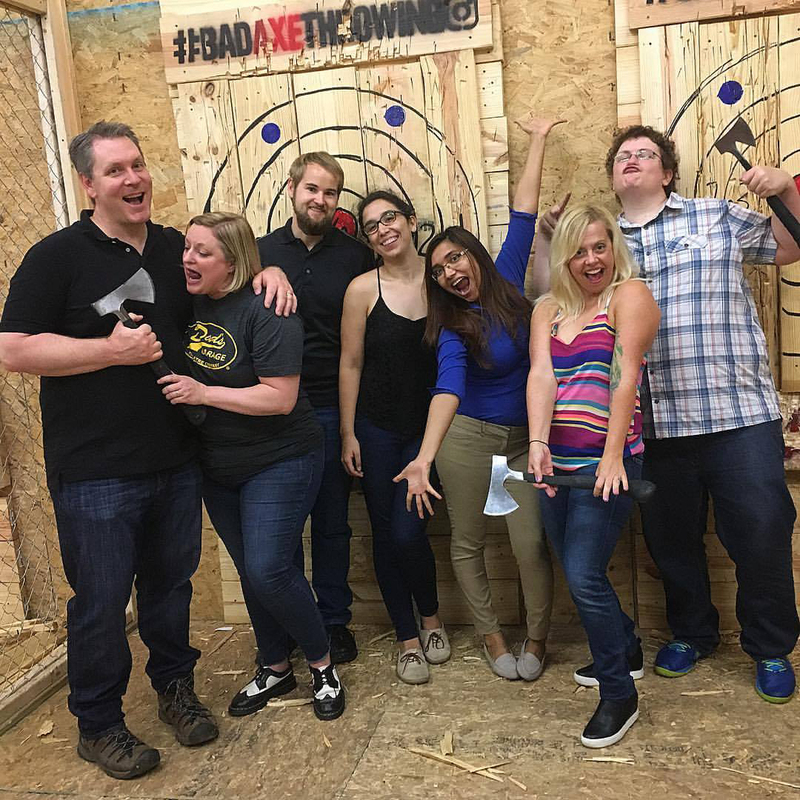 So says my buddy Carl Christie, who with a bunch of other friends recently joined me at Bad Axe Throwing on the Westside for some axe-chucking fun. He has so many certifications and titles, it’s like alphabet soup, but for the purposes of learning about how axe-throwing might engage your muscles, I’ll only mention here that he’s a neuromuscular therapist and corrective exercise specialist. Between rounds of hurling the hatchet—which in this low-frills, echo-y, warehouse-like space makes a startling “thwack” when hitting the wooden target—Christie pointed out what might get worked in a workout like this. He disagreed with this article in Men’s Health that claimed axe-throwing would primarily build up your lats, shoulder muscles, and core. When throwing the axe with two hands, it’s held above and behind the head, then whipped toward the board. For that, most of the power comes from the lower pectoralis major (sternoclavicular fibers) of the chest, as well as the triceps. “The eccentric forces to put a bit of ‘whip’ into the throw are the elbow flexors,” Christie says. For a one-handed approach, you step into it like a baseball throw, bringing the axe above and behind your shoulder, then hurl the hatchet forward. This strategy can engage the abdominals (primarily the obliques), he says, but never as much as it would if you were chopping the axe downward. I felt that—frequently, given how many times I threw with all my strength (Behold! I am a mighty warrior!) and then watched as the axe clumsily bounced off the board and clanged to the floor (Look away! I am a pathetic weakling!). But that just made the hits, and the mild muscle burn, all the more satisfying.